Vallum is a security tool and runs using administrator privileges thus it is important to install and run only legit copies of Vallum obtained from trusted sources. 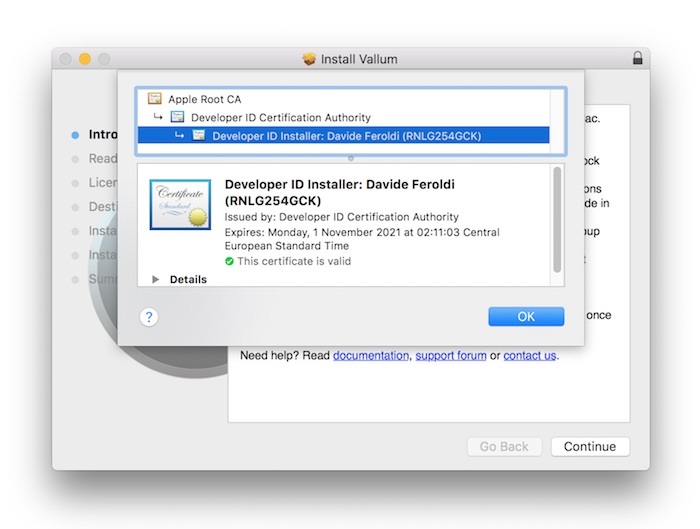 Vallum Installer package and all its content are signed using a valid Apple Developer ID Certificate issued by Apple. You can verify it clicking the “locker” icon in Vallum Installer title bar on right-top. Another way to verify Vallum integrity is setting the macOS preference to run only software from known developers. You find this option in macOS System Preferences -> Security -> General. When this option is set, only apps from trusted developers are allowed to run. Activate this option then run Vallum installer. Please note: the best place on the Internet to get Vallum is www.vallumfirewall.com. There you always find the latest releases, betas, nightly builds and such.